Technology has transformed all facets of our society, from the way we work, to the way we communicate with friends and family, to the way we consume entertainment. While nearly every element of our day-to-day is now reliant on technology, perhaps no activity has been more greatly upended than the way we shop. Mobile devices have created a fragmented buying journey, and platforms like Amazon have fundamentally changed the way we think about commerce and the brands that serve us. With brick-and-mortar stores closing at a rapid pace, and e-commerce expected to reach 15% of all retail sales by 2020, brands are understandably eager to get ahead of market trends and beat out a growing presence of global competition. These challenges must be solved across all consumer industries, including retail, travel, housewares, beauty, luxury, hospitality, and automotive, among others. Additionally, marketing has grown increasingly visual in recent years, with the proliferation of social networks like Facebook and Instagram, and the growth in digital touchpoints where consumers choose to engage with brands. 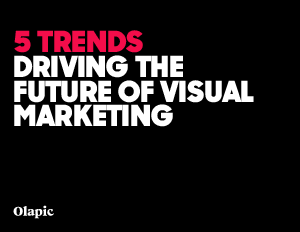 As a result, modern marketers are turning to new sources of visual content, and implementing more connected consumer experiences. Still, the pace of change is staggering, and many brands are left wondering how they can stay ahead and build loyalty with younger, more digitally native audiences.